Bugs, rain and the daily grind: all reasons Canadians say they spend less time outside now than ever before, according to an Ipsos survey released last week. A survey released last week confirms grown-up Canadians still like to groan about going outside to play, often because they find outdoor activities too uncomfortable or time-consuming. The Ipsos poll asked 2,000 Canadians to report how often they traded urban comforts for a natural setting. Although nine out of 10 agreed they're happier when surrounded by wilderness, three-quarters admitted they find staying inside "easier." That answer varied considerably by age, with 80 per cent of millennials agreeing to the statement, compared to 68 per cent of baby boomers. Rain, extreme temperatures and work pressures topped the list of reasons people avoided the outdoors, with a full third of respondents saying they don't like the bugs and a quarter claiming they can't find the motivation to leave the city. Seven percent said they "didn't know what to do" in nature. But as two-thirds of respondents recalled, it wasn't always that way. The bulk of participants had strong memories of spending more time outside as kids. 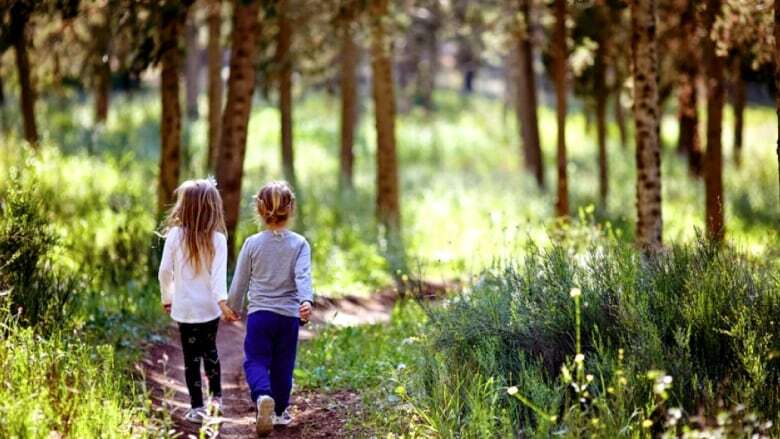 "It did reveal that Canadians aren't spending that much time in nature — certainly not as much time as they used to," said Lesley Marian Neilson, spokesperson for the Nature Conservancy of Canada, which partnered with Ipsos for the survey. Whether that discrepancy reflects reality or stems from a rosy perception of the good old days isn't clear, Neilson said. But Neilson found it concerning that four out of 10 Canadians say they don't spend any recreational time away from human-made environments at all. "That's a little alarming," Neilson said. "There's a saying — 'People will protect what they love, and love what they know.' If they know nature, and love it, they'll protect it. There's a chain effect." On average, the survey found Canadians spend just over an hour in nature on weekdays, going up to two hours on weekends. Neilson said the average was likely skewed up by a few people who spend lots of time outdoors. The vast majority, she explained, spend very little time outside. The poll is accurate to within 2.5 percentage points, 19 times out of 20. Survey results weren't broken down by city. But, anecdotally speaking, Celina Starnes, public education manager for the Stanley Park Ecology Society, says the trend seems to be reversed in Vancouver. The society has doubled the number of people showing up for events at the park in the last three years. "I think it's very regionally specific for us in Vancouver," she said. "People are saying, hey, we want to be a short walk from an ecologically-diverse space." Starnes points to creative programs like their bitters-making workshop, which teaches people how to create their own tinctures from plants found in the park, as possible motivators. But she's also noticed more excitement over the beavers, otters and other wildlife in recent years, with visitors eager to encounter critters firsthand. "We're seeing a boom because of that authentic experience. You're not just watching a movie about exotic birds, you're seeing baby eagles with their heads popping over the sides of their nests," she said. Starnes said there's an emerging market for those real-life sights, and has a hunch as to why. A generation that grew up listening to David Suzuki has now settled down in their careers, she suggests, and had kids of their own. With a rainforest on their doorstep, "they're looking for different things to do, not just finding their dream jobs and going to the bar every night," she said. "Plus, there's the Instagram cred."